Basin resurfacing (sometimes referred to as refinishing, re-glazing or re-enameling) is a process whereby basins and sinks can be repaired and given a new surface. Basin resurfacing using Classic Surface by Worldwide Refinishing Systems produces an immediate and dramatic transformation, giving old and damaged surfaces a showroom finish. The work can be completed in-situ without removal or in a workshop if more convenient during the bathroom renovation cycle. 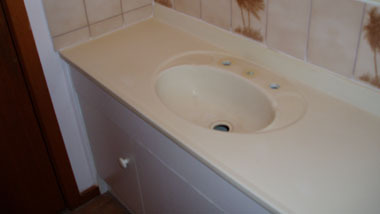 Basin resurfacing is the same basic process as for bath resurfacing. Basins and vanities are an integral part of the bathroom and come in all shapes and sizes. If you are contemplating a bathroom renovation, then you can either replace a basin because it doesn't fit in with the new layout, or resurface it because you appreciate its appearance and functionality. 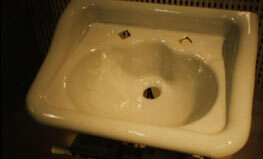 Cast iron pedestal basins which have a distinctive 'period' appearance. Built-in vanities with hardwood cabinetry for which a close-fitting replacement top cannot be found. If a basin or vanity is to be resurfaced at the same time as the rest of the bathroom, the resurfacing will cost much less than purchasing and installing a replacement, with the added advantage of colour matching if needed. 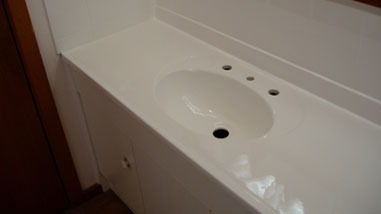 However, there are too many shapes and sizes to be able to give a firm cost, but the vast majority of basins and vanity tops can be resurfaced in-situ for between $150 and $250 depending on size and condition, provided the work is completed in-situ at the same time and in the same colour as the rest of the bathroom. Should you only need the basin resurfaced, the cost will be higher because travel and site set-up have to be recovered in the price of the job. Cast Iron Pedestal Basin - from dull blue to shining white. Acrylic Vanity Top - from dull white to gleaming dark grey. Pressed Metal drop-in Basin with Stainless trim - pink underneath! 75 year old pedestal basin with new antique white finish. Before: Dull, scratched vanity top & splash-back with old tile pattern. Before: Pink Cast Iron Pedestal Basin rusting round the edges. Before: Marbled Vanity Top with stains, chips & crazing. After: Repaired and transformed to showroom appearance. If all you need is a repair at the most economic price possible, then a stitch in time can save nine, postponing replacement (or resurfacing) for several years. Which basin do you have? Basins come in all shapes and sizes and include pedestal basins, wall-hung basins, drop-in basins, under-slung basins, molded vanity basins and so on. They can be cast-iron finished with a porcelain surface, pressed steel finished with a stove enamel surface, china finished with vitreous surface, molded plastic with a gel coat finish, molded acrylic with fiberglass backing and so on. 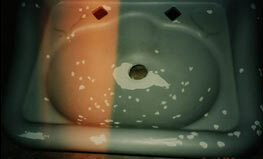 Before: Cast Iron basin with many chip repairs from old shaving tool! Cast-iron: Can usually be cleaned out, filled and resurfaced. China: Cannot be satisfactorily repaired and if radiating from the drain hole, will most likely worsen. Molded Acrylic: Due to poor support or impact. Can be repaired but may not last the lifetime of the fixture. Porcelain: Leaching of glaze over years leading to porosity, staining and cleaning difficulties. Same issues with S/Enamel and Vitreous Enamel. Acrylics & Gel Coats: Gradual loss of shine due to cleaning and use, sometimes accompanied by surface crazing. Can be filled and resurfaced or buffed out if crazing isn't present.